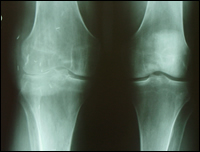 Inflammation of the joints (the junctures where the ends of two or more bones meet). Persons most commonly affected: Women are at a greater risk than men. Symptoms and indications: Swelling, tenderness, pain, stiffness, and redness in the joints. Pain is often worse in the morning than in the day. Damp weather and emotional stress do not cause arthritis, but they can make symptoms worse. With rheumatoid arthritis, there may also be feelings of fatigue and fever. Causes and risk factors: Poor diet, age older than 50, history of immobilization, injury to the joint, joint hypermobility or instability, obesity (weight-bearing joints), prolonged occupational or sports stress, congential or developmental disorders, endocrine problems (hypothyroidism, excess estrogen, insulin sensitivity, increased growth hormone levels, low somatomedin levels), hereditary factors, and nutrient deficiencies are all causes of arthritis. Prevention: Moderate daily excercise, such as swimming, walking, or physical therapy, is critical to maintain mobility in arthritic joints. Maintain correct posture and body weight. Eat a lot of fiber in the form of raw vegetables and whole grains. It will help sweep away mineral and acid build-up and keep your digestive system free of harmful bacteria. Cruciferous vegetables such as broccoli and cauliflower also have anti-inflammatory properties. Foods high in sulphur will help repair cartilage and bone. Try eating some asparagus, cabbage, garlic, or onion every day. Avoid acid-promoting foods such as red meat. eggs, oils, fried foods, sugar, dairy products, refined carbohydrates, foods high in gluten (such as breads, pasta, and pastries), alcohol and caffeine.